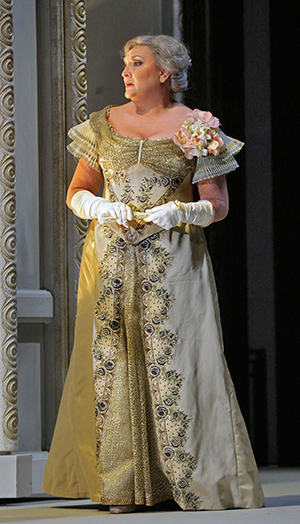 Livengood as Adelaide at the ball in ARABELLA. Photo by Ken Howard. Mezzo-soprano Victoria Livengood has sung over 250 performances of�Carmen's title role�in her lifetime. She has performed at virtually every major opera house in the world. Her repertoire ranges from Menotti to Mozart. And yet, there are still places she has not performed, arenas yet to conquer. One of those arenas is The Santa Fe Opera. This summer marks Livengood's debut with the Company, as well as her role debut as Arabella's feisty, social-climbing mother, Adelaide. And just how does she feel about adding Santa Fe to her C.V.? "I absolutely love it here," says the energetic, North Carolina-born singer (the "Dixie Diva," to borrow a moniker from her website). "I have so many friends who have sung here over the years, and to be making my debut here is almost surreal!" What makes Santa Fe different from other opera companies? "The surroundings of where we're working are just magical," says Livengood. "You're walking from rehearsal to lunch and you're surrounded by the desert and the mountains, and the pool, even lunch at the cantina � we all just LOVE having lunch at the cantina. In a way, it's like you're at the best summer camp in the world � you have great friends around you, and of course you're working very hard, but work seems less like work when you're surrounded by that kind of beauty." And how about adding the role of Adelaide to her gallery of characters? "My whole focus as Adelaide is getting Arabella married off so all of my problems can be resolved � Zdenka [Arabella's sister] dressing as a boy is an afterthought [Zdenka's parents raise as a boy to save money]. As Adelaide, I think all my problems were caused by my husband's gambling � I'm frustrated, manipulative � all I want to do is get my beautiful life back through my beautiful daughter, Arabella. It's very hard to play a character like that, yet find the sympathy, find another facet of that that makes the audience like her. But if you are honestly trying to tell a story, regardless of the role you're playing, if you're being a real person rather than a character, if it comes from a real place, you�can�be a crazy character, but you have to be real, otherwise the audience can tell in a minute." So where does Livengood find Adelaide's realness? Do singer and role have any qualities in common?� "Well, I LOVE clothes, I love being dressed up, I love a good party. You mention the word, 'ball,' and I'm all over it! I love being the center of attention and at times she [Adelaide] gets to be that." And speaking of those clothes, "I have to say, I don't know when I've had more attention to detail. The people who run the costume shop � starting with [Costume Director] David Burke and down to every last person � have been incomparable. The care and attention � right up until the final dress rehearsal they are tweaking every single thing. In most places, there is no time for that � they get you into something, they get you out of it, and that's that." "Tobias Hoheisel, the set and costume designer, gets major credit. There are women of all shapes and sizes in this cast, and he has made every single one of us look her best. In all the years of my career, this is one of the best experiences I've ever had with costumes. There are just no words to express how excited I am to be here." Ms. Livengood, the Back Deck is certain the feeling is mutual.